The official list of stadiums for Russia’s 2017 Confederations Cup includes only four stadia and Luzhniki is not among them. And yet deputy mayor Marat Khusnullin stated yesterday that the new national stadium will be ready to host its first major game during the tournament. His optimism is caused by very good work pace at the stadium. Khusnullin claims that almost all work at the stadium will be ready by the end of 2016, only with several elements being left for early 2017, including the commissioning of the stadium’s technical equipment. 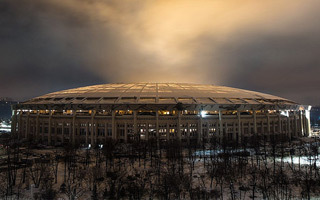 Luzhniki are marked by FIFA as ‘green’, which means local organizers are at no risk of missing deadlines expected for the stadium. Currently the building is being fitted with 40 elevators, several of which are already in place. They will be used mostly by stadium staff and business guests, though some are created specifically for spectators with disabilities. Also, by the end of February all 81,000 seats will be installed, with some 20,000 currently in place. Until spring the hybrid field will also be heated by special lamps to make up for the lack of sunlight during Moscow’s ‘darker’ months.